After you have completed your spring cleaning it is time to update your home's decor to freshen up your home with soft pastel accents which are perfect for spring decor. Here are 22 DIYs that are perfect to add some soft color found in spring blossoms to your home. Give your home some extra curb appeal with a brand new doormat for your front door by stenciling "let's stay home" on a regular outdoor mat for an easy DIY project. Bring some fresh cut flowers inside your home by making a stunning patterned vase to store your blooms within your house. Pet furniture is often ugly, so treat your cat with a place to scratch that you will not mind looking at in your home. This DIY palm springs inspired cat house is the perfect place for your cat to hide or to scratch the cardboard inside and is much nicer than any cat house you can find in stores. Get ready for pizza night by making some pizza trays to hold all your pizzas on your table with these modern trays that you can place in the center of your table. One of the easiest ways to change the look of a room is with paint, so this weekend update your kitchen by painting the cabinets a soft pastel color to give your kitchen a makeover without spending much money. 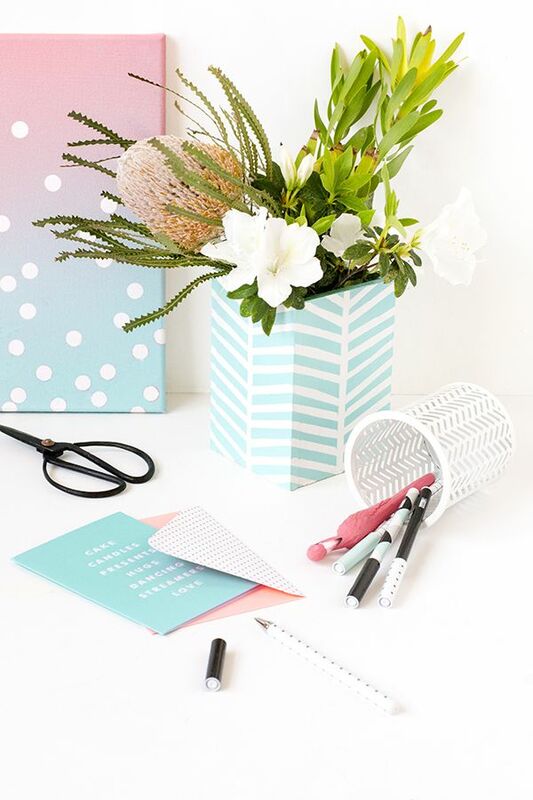 Keep your office supplies within easy reach on your desk by making your own stylish desk organizer. Need inspiration for the next party you are hosting? Take regular white balloons and painting a beautiful watercolor design using acrylic paint onto the balloons. To decorate for the party, you can gather a few of the watercolor balloons together around the snack table for some affordable party decor. Freshen up your old metal cabinet in your office by painting a graphic design on the front to give it a modern look. Hang this playful cake slice DIY wall clock to your home for an easy way to add some pastel colors to your home's decor. 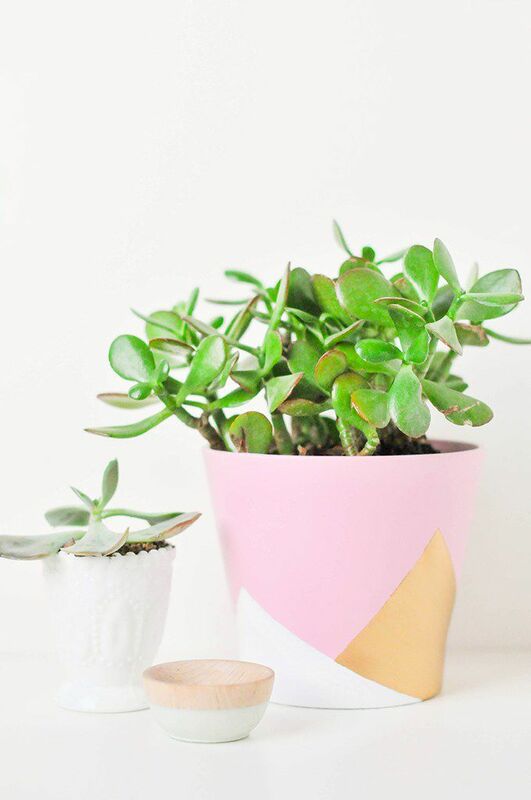 Replant your houseplant into a gorgeous DIY color block geometric pot that you can make by painting the design with acrylic paint. Beautifully package a small gift in a chic handmade gold edged gift box to make any present look more expensive. These DIY gold edged gift boxes would also work well for storing small items in your home on bookcases or within your office. Freshen up your old patio chairs with a paint to give them a cheerful new look with a soft pastel color that will look amazing in your back yard. Encourage your child's imagination by making them an ice cream stand for them to play with that can be built out of cardboard. Update your glassware, from vases to cups by painting the bottom of them with paint to give them a new look with spray paint. Style your hair for your next cocktail party with some handmade gemstone bobby pins that recycle old necklaces that are broken or that you are no longer wearing into lovely pins for your hair. Have you been meaning to get a headboard for your guest room? Affordable to make, this DIY painted plywood headboard is perfect for anyone on a tight budget who is looking for a quick to make headboard that will still look great. Freshen up your office chair with a coat of paint to add some color to your workspace with a color blocked office chair. Gift a bottle of wine with these fun printable wine tags that can sit on the bottle of wine. These DIY wine bottle tags are perfect to quickly wrap a last minute gift of wine before you head over to a party. Next time you bring cupcakes to work or send cupcakes to your child's classroom, make your homemade cupcakes look extra spectacular with some quick to make tissue paper cupcake toppers that can be stuck onto the top of each cupcake. You spend so much time each day at your desk at work, it is important to spend some time to help make your office space feel more appealing. One easy way to beautify your desk is by making a brand new mouse pad to add some colors to your workspace. Paint a wire basket a soft pastel color to make a beautiful lampshade perfect for hanging in your home. Add some personality to your laundry baskets by painting the bottom and adding some funny text to them with this simple DIY project that will make you smile every time you see it.